Carniny Youth Under 12s cruised into the last 16 of the NIBFA cup with a commanding performance against west Belfast side Glendowan on Saturday. The Ballymena Reds scored eight without reply, including a hat trick from Lewis Mearns. The Under 13s continued on from their NIBFA Cup victory last Saturday with a National League win against Warrenpoint Town, courtesy of a single strike from Adam Gordon. The Under-15s were knocked out of the NIBFA Cup by Carrick Rangers and the Under-14s lost out to their unbeaten league leaders, Linfield. Due to the number of sporting injuries throughout the 12 teams within the club, Carniny Youth and Amateur FC has appointed a club physiotherapist in the form of former player and local lad Peter Eagleson who is recently qualified in this field from University. Peter will be based at the Showgrounds during the club’s training nights to be on hand to deal with players’ injuries. The club are delighted to have Peter on board which is a positive step for this progressive club. Carniny Amateur & Youth FC were last week delighted to be the recipients of generous sponsorship from R Mairs Service and Parts Centre, Carniny Road. The sponsorship will go towards new training kit for Carniny under 16s who play in the Northern Ireland Boys FA National League. Carniny Youth 8, Glendowan 0: Carniny were playing Glendowan in the last 32 of the NIBFA cup and hoped to get back to winning ways after last weeks league defeat. Their cause was helped when within a minute of the kick off it was Jake White who first won the corner and then scored straight from the corner kick to make it 1-0. Lewis Mearns then finished well when put through from Kyle Anderson to make it 2-0. Anderson got one himself when assisted by Aidan Graffin to make it 3-0. Glendowan continued to play some great passing football but were hunted down by every Carniny player until they lost possession. Lewis Mearns then got Carniny’s fourth with a good low drive. Simpson crossed well for Jake White for a simple tap in for his second and Carniny’s fifth. Lewis Mearns then got Carniny’s sixth and his hat trick from the penalty spot when he was fouled in the box. The Carniny defence of Simpson, Farquhar, Robinson and Lamont was rarely troubled. Daniel McNicholl in goals had a quiet day. It finished 6-0 at half time. Despite the score Glendowan came out at half time and raised their game. Carter Hamilton in midfield was matching their tackling. Carniny got their seventh when Aidan Graffin got on the score sheet with a sweet strike. Young was brought on for Simpson in defence. Nicholas Moore was rewarded for his hard work all day when he was put through by Anderson, just when it looked that he had taken it too wide, he unleashed a rasping strike that flew into the roof of the net to make it 8-0. This was a great performance by Carniny especially as they were missing a couple of key players. They now look forward to a home match against Moira FC in the last 16. Carniny: McNicholl, Lamont, Young, Farquhar, Robinson, Anderson, White, Hamilton, Moore, Mearns, Simpson, Graffin. Carniny Youth 1, Warrenpoint Town 0: It was back to league business for Carniny who were up against a well organised Warrenpoint side. Carniny began the brighter of the 2 sides squeezing the play well up on the flanks with both Logan and Archer looking threatening with strong runs testing the full backs. The game was starting to open up and was a real midfield battle. 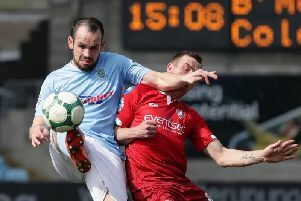 An in swinging corner from Warrenpoint caused Carniny problems but the resulting effort caused Jake Parker no problems. First chance for Carniny fell to Joshua Courtney who, with a low drive the ball whistled past the post. Carniny were putting the pressure on now in search of the opening goal with Stewart on top form bringing a good save from the keeper then moments later from a Matthew Kirk free kick the ball fell to Conor Stewart to flicked the ball goal wards only for the keeper to tip it past the post. Warrenpoint were threatening also, having a free kick which just flew past the post. Parker made a brave save in a crowded goal mouth with the ball deemed for the net. Another chance fell to Courtney who hit a shot on his weaker side brought a solid save from the keeper. Warrenpoint began the second half strongly by pushing Carniny back looking for an opening but Carniny’s defence were on top and played their way out of trouble. Now Carniny were on top and playing some super football, spraying the ball around and with this pressure the deadlock was broken when Adam Gordon was played through and from the edge of the box stuck a lovely shot into the corner of net. Carniny had their reward and wanted more and Gordon and Logan both bringing good saves from the keeper. Time was nearly up and Warrenpoint had a free kick in a dangerous area but Carniny were determined not lose any points and the ball was cleared to safety. Carniny finished off with possession to take the points. This was Carniny’s best performance of the season. Carniny: Parker, Ervine, Winter, Clyde, Fleming, Close, Kirk, Archer, Stewart, Gordon, Logan. Result: Carniny Youth 0, Linfield 3. Carniny Youth 2, Carrick Rangers Colts 3: Carniny suffered their first defeat since the first week in October when they produced a lacklustre performance against a highly motivated Carrick Rangers in the NIBFA Cup at a freezing cold Wakehurst. The away side started strongly and forced James McClean into more than one save in the opening exchanges. They deservedly took the lead after ten minutes when their dangerous centre forward evaded Calum McGall’s desperate challenge and finished with assurance from about 12 yards. Rangers made it two nil on 20 minutes when they scored from close range after a well constructed move. This seemed to galvanise Carniny and for the remainder of the half they created 3 great chances from close range but Philip Maybin, Conor Doherty and Jordan Hassan all failed to convert. Carniny brought themselves back into the game after five minutes of the second half when Thomas Campbell made a great run into the box from the halfway line, played a one-two and smashed the ball into the net. The Reds poured forward after that in search of the equaliser but were caught by a sucker punch with 15 minutes to go. The ball was given away deep inside their own half and broke to a Carrick player who found the top corner with an unstoppable shot from 25 yards. Carniny did not give up and Campbell reduced arrears with 8 minutes to go when he finished clinically from around about the penalty spot. Sadly the expected push for a late equaliser never materialised and indeed the away side looked more likely to score in the closing stages. A deserved win for Carrick and disappointment for the Reds whose match winning players simply did not show up. Carniny: McClean, Campbell, Evans, McGall, McComb, Ferris, Houston, O’Mullan, Hassan, Doherty, Maybin, Adams, Keenan, Galbraith. With January now upon us the ‘Transfer Window’ has opened not only for the club’s National Youth League teams but also the club’s Senior Intermediate Level and Junior teams. Anyone interested in joining the club should make contact using the numbers listed below. Like wise coach enquiries are also welcome throughout the various age groups. 2006 and above (Football Development Centre) Davy 07803974402; 2005- Niall Greer 07920095385; 2004 - Davy Hanna 07791297755; 2003 - Jonny Wilson 07704550454; 2002 - Jason Hunter 07885899290; 2001 - Davy Parker 07835020446; 2000 - Davy Leetch 0773280858; 1999 – Darren McGall 07812604932; 1998 - Billy O’Flaherty 07850669666; Seniors Anthony 07708822793. Carniny Amateur & Youth FC are also currently seeking expressions of interest for management, coaching and playing staff at U19 level within the club for the 2014/15 season. Manager must have or have attended and started the first part of the UEFA B coaching diploma and be working towards completion in a reasonable time frame. Assistant Coaching staff enquiries are also welcome. Interested players are also welcome to make contact. Ideally 1996 and 1997 players.